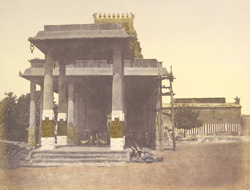 Photograph of the entrance to the Parthasarathi Temple, at Madras, taken by Frederick Fiebig in c.1851. The Parthasarathi Temple is one of two large temple complexes in Madras and is situated in Triplicane. It dates from the 17th century onward and is a celebrated sanctuary dedicated to the worship of the Hindu God, Vishnu as Parthasarathi. It has two entrances at the east and west, and this is a view of the east entrance. It takes the form of a gopura, a gateway surmounted by an elaborately carved tower that is just glimpsed in this view. Little seems to be known about Frederick Fiebig. He was probably born in Germany and became a lithographer (and possibly was also a piano teacher) in Calcutta, publishing a number of prints in the 1840s. In the late 1840s Fiebig turned to photography using the calotype process, producing prints that were often hand-coloured. His photographs includes several hundred views of Calcutta in the early 1850s, one of the earliest detailed studies of a city, a large hand coloured collection of which were bought by the East India Company in 1856, their first major acquisition of photographs. Among the roughly 500 pictures were views of Calcutta, Madras, Sri Lanka, Mauritius and Cape Town.